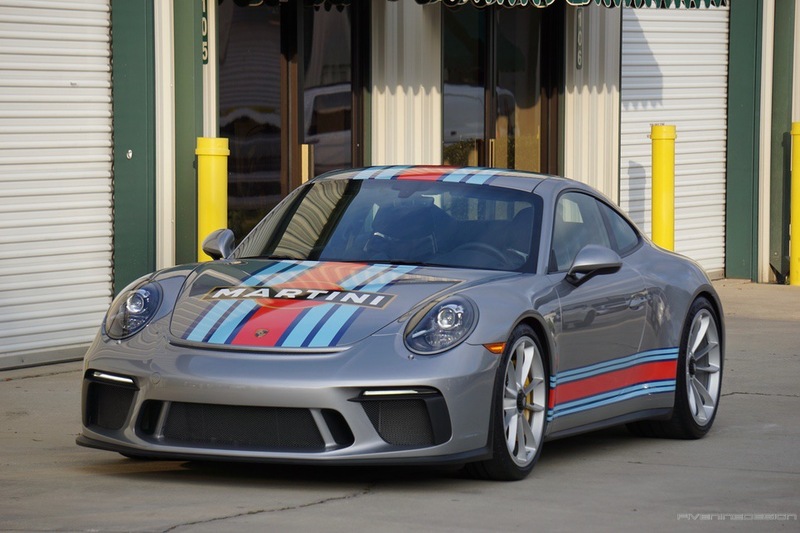 Update 3/15/19: This GT3 Touring is following the market down; the new asking price is $172,990 today, down a bit over $22,000 from January when it was $195,159. The 2018 Porsche 911 GT3 Touring. Otherwise known as the car that crushed every 911R speculators hopes and dreams. This was no mistake either. 911 boss August Achleitner came out and said that the GT3 Touring Package was created partially in response of secondary market 911R prices going insane the second they were announced. Of course there are some differences between the R and the Touring because Porsche didn’t want to anger all 991R owners to complete madness. The R has a magnesium roof along with carbon fiber fenders and hood to save weight while the Touring has the normal metal. The Touring also has a 9,000 rpm redline, slightly up from 8,600 in the R. The rest? Pretty much the same. Production numbers weren’t limited on the Touring and the number still isn’t final since they are just wrapping up final production on the GT and Speedster 991 chassis before going full swing in 992 production. What I would like to know is what has happened to the 911R market now that these cars are out in the wild and what about the market the GT3 Touring themselves? Well, lets just say people have entirely too much money. 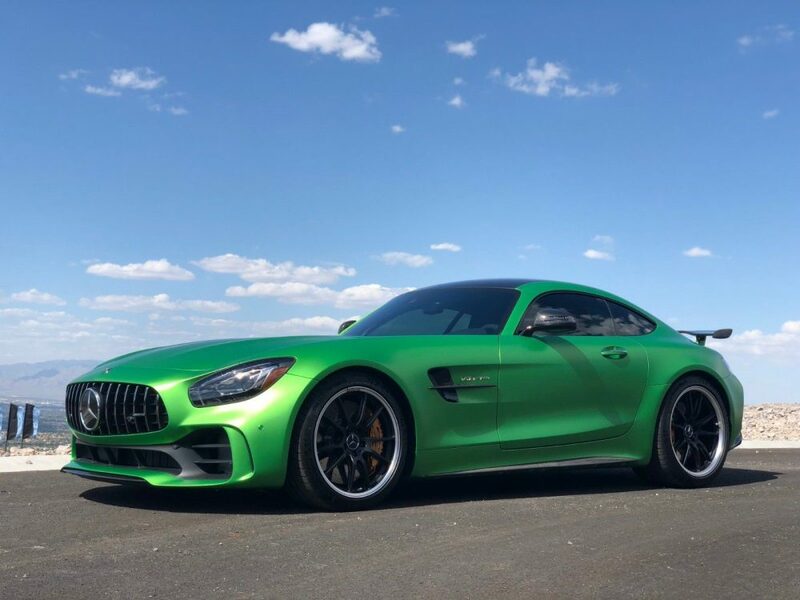 My favorite new Mercedes-Benz, the AMG GT R, just past its first birthday and I thought I’d swing back around to check in at where they are at value wise. When I first look at this model, a Green Hell Mango example with just 42 miles was listed for a little under $260,000. 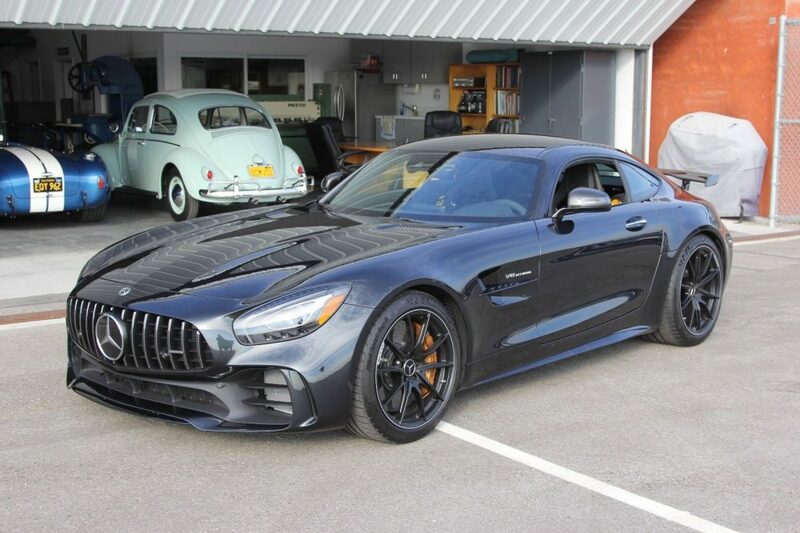 I thought that was a little odd because the sticker price was around $190,000 and some very good Mercedes customers were getting them for that. A few months later I looked at a black one with 300 milesÂ that was listed much cheaper atÂ $207,500. Quite the discount. Then, back in October I found another Green Hell Magno (what a name) with 2,200 miles forÂ $185,000. Naturally, I thought I’d keep up with the pattern and check out another Magnetite Black car up for bid in the Los Angeles area. Are the prices still dropping? Almost exactly one year ago I took a look at Mercedes-AMG’s latest and greatest car, the GT R. It was a car to rival all the other crazy German GT cars as well as every other track-focused GT car that was out at the time. The specs and the reviews were good and sellers were fresh to try to cash in on the hype with asking prices well over sticker price of around the $200,000 mark. The car I looked out a year ago had an asking price of $260,000 with just 42 miles and while it probably didn’t sell for that, I’m sure a decent profit was made by flipping it. Today, I wanted to circle back around and check in on a GT R with just a handful of miles to see how the prices have held up during its first year. Looking at the numbers, I can’t say that I’m all that surprised. It is not uncommon for us to come across Porsches touted by their sellers as “the most highly optioned 911 ever” or some such thing. The window sticker will be a full-page of optional extras and it’ll have a super high MSRP. The problem in many cases is that a lot of those builds aren’t really much more than a buyer checking off every box on the option sheet. It is indeed a highly optioned 911, but you might never know it unless someone sat you down to point out each option. They aren’t really all that special. This 911 took a slightly different route to arrive at a similar result and I think it’s much better for it. Here we have a Pascha Red 2018 Porsche 911 Carrera Cabriolet with an Espresso over Cognac natural leather interior with Houndstooth inserts. It also has the Sport Design Package, PCCB, and a host of other more standard options. Rather than going through and checking all of the option boxes, this buyer chose the most different options available. As such, simply by the number of options this probably isn’t the highest optioned 911 we’ve seen (though it can’t be far off), but by cost it would be pretty difficult to surpass it. 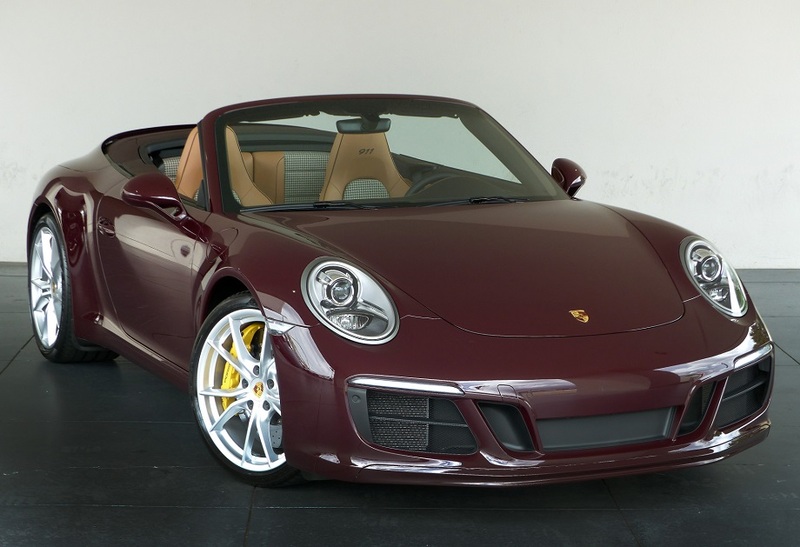 The result is a Carrera Cabriolet with an MSRP of nearly $160K. That’s almost $60K in options! On a base Carrera! It shouldn’t take you long to recognize that this is a fairly limited production 911. It’s right there in its name, “Exclusive,” though you also could just look at the darn thing. 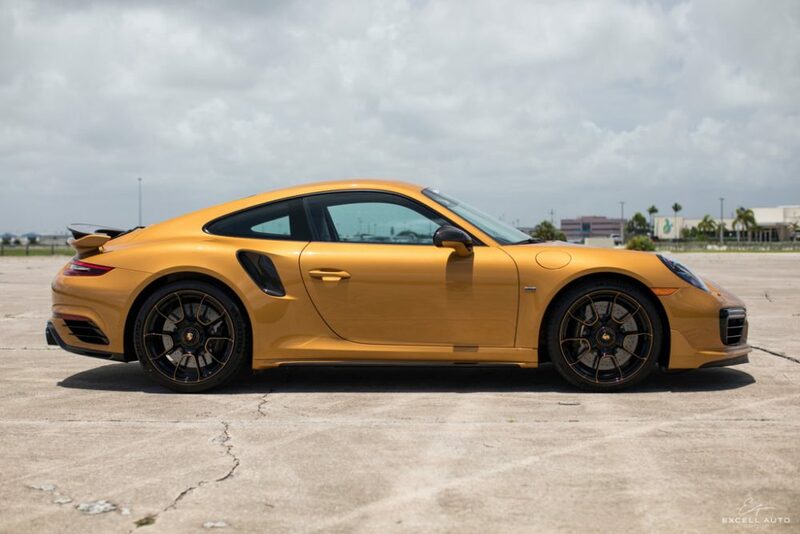 A Golden Yellow Metallic Porsche isn’t exactly commonplace. Add in the Black center-locking wheels with Golden Yellow accents, loads of carbon trim, and Turbo Aerokit and you know you’re looking at something special. This is all before we even open the doors and step into the interior. And, oh yeah, it has 607 horsepower. That’s 27 hp more than the already pretty high-powered 911 Turbo S.
I came across this 2018 Porsche 911 Turbo S Exclusive and figured I’d add it to our list of very high-priced and limited production 911s I’ve posted lately. If you want one only 500 will be produced. I don’t know how many currently are on the ground, but I have only seen one other for sale. It was not Gold. While I expect we’ll see a few more of these pop up just as we have with the various GT 911s I don’t know if we’ll see quite as many. Markup, of course, is substantial, though not GT2 RS high. The king of the current 911s, the 2018 Porsche 911 GT2 RS, finally has hit the ground and a few of them are popping up for sale so I thought I’d put together a post to highlight some of those I have seen. I doubt these are the only ones currently available; I also doubt you’ll have any trouble finding others up for sale in the coming months. 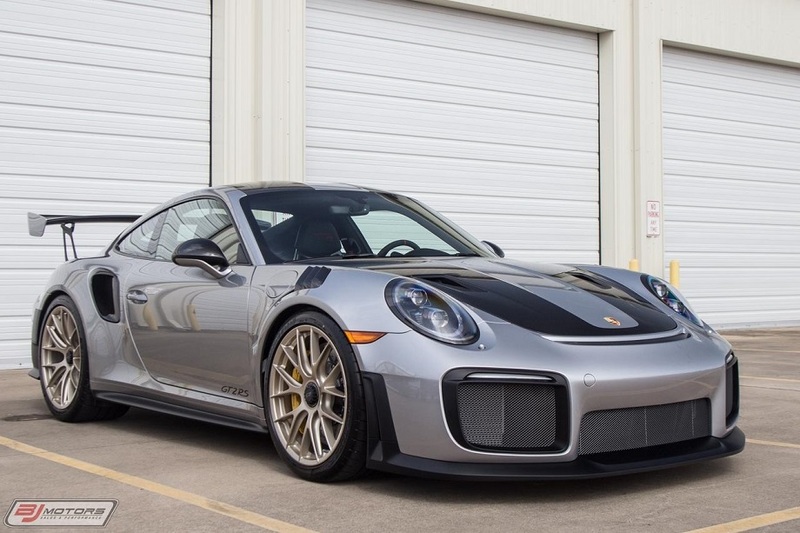 Like the current GT3 and the GT3 RS before it (and like the 991.2 GT3 RS soon to hit our shores) ample opportunities will exist to get your hands on a very lightly used example. Assuming you want to pay the substantial markup. In the case of the GT2 RS we’re talking anywhere from $150K to $200K over MSRP. That’s basically an entire GT3 by itself and means you’re looking at over $500K all in. So what are you getting? A 3.8 liter twin-turbocharged flat-6 delivering 700 hp via Porsche’s 7-speed PDK transmission only to the rear wheels. Relative to a Turbo S it’s also lost 286 pounds in weight. Add the Weissach package, as all of the below have, and you lose another 40 pounds while adding a bunch of carbon fiber details. You also can have a lot of red in the interior should you so desire. It’s lapped the NÃ¼rburgring nearly 10 seconds faster than a 918 Spyder and those are not exactly slow cars. So, um, yeah performance will be insane. Do you need all of that performance? Of course not. Do you want it? Most definitely! I’m just sort of posting this one for fun. I’ve featured a couple of 2018 GT3s and this one is pretty similar. Low miles, manual transmission, decently high markup. I think you get the picture. 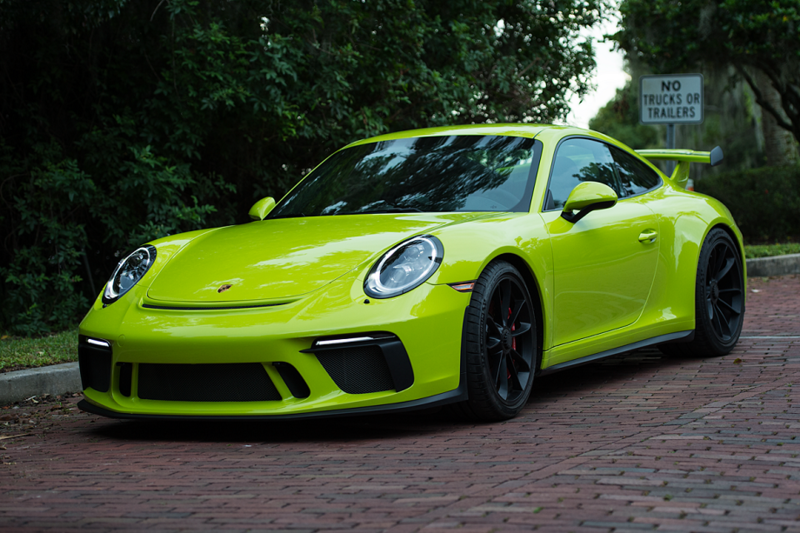 I wanted to post this one mainly to go with the Chartreuse and Birch Green 911s I’ve posted recently so I can complete the neon green 911 color wheel. But, of course, also to bring it to the attention of anyone who might have their eye out for one of these very brightly colored, nearly new, GT3s. 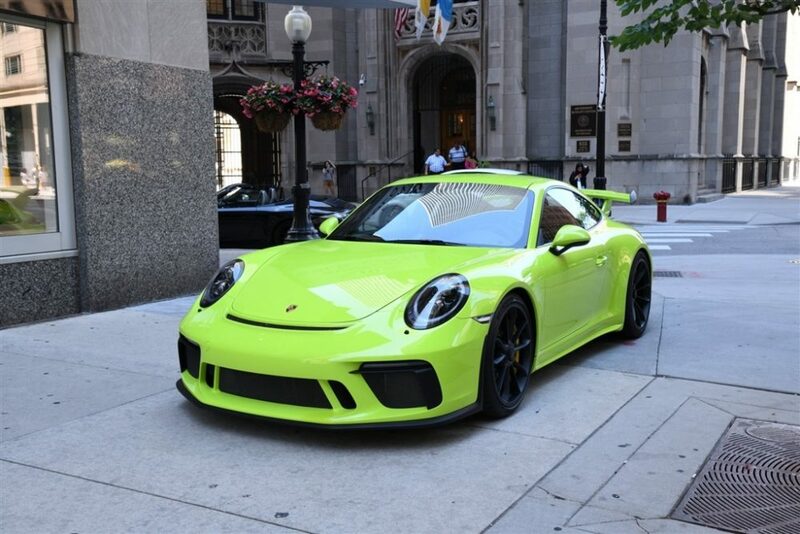 This is an Acid Green 2018 Porsche 911 GT3, located in Chicago, with 1,191 miles on it. I could be wrong, but I believe Acid Green had its debut on the 918 Spyder’s brake calipers. Here we see it on the whole car, though the seller has chosen to photograph it in such a way as to minimize the brightness as much as possible. Here it looks subdued. Acid Green is not subdued. The 991 Targa is a stunning car. There aren’t a lot of them so I don’t get a chance to see them often, but recently I walked past one parked on the street that made me stop. It was totally blacked out so it had that sinister Darth Vader vibe about it and looked great. I have always been a 911 Targa fan and there is something about the 991 Targa that appeals to me more than the design of the Coupe. Perhaps I just like the utility more of the open roof so I’ve convinced myself it’s a prettier car, or perhaps it’s the slightly different lines created by that open roof and larger rear window. Whatever it is I’m now fully on board and find myself keeping an eye out for them more and more. So it should come as no surprise that this paint-to-sample Pastel Orange 2018 Porsche 911 Targa 4 GTS caught my eye. It’s new so there shouldn’t really be any questions and while that also means you could simply build your own and get it exactly how you’d like, getting a PTS allocation isn’t necessarily easy and this one is here now and ready to drive.